There are almost as many dog collars and leashes available as there are blades of grass down the local dog park. This can make the task of cutting through the noise to buy the most suitable one a hard task. Not all leashes are suitable for all situations, and many can be found somewhat lacking in quality. So you need to choose the right collar and leash – of the right type and of decent quality. To help you with your decision, we’ve put together a short list of high quality leashes to suit every situation that we’re happy to recommend. We’ve chosen these leashes based on their strength and suitability for large and strong dogs, for their stylish looks and going by high ratings and excellent customer feedback from previous buyers. 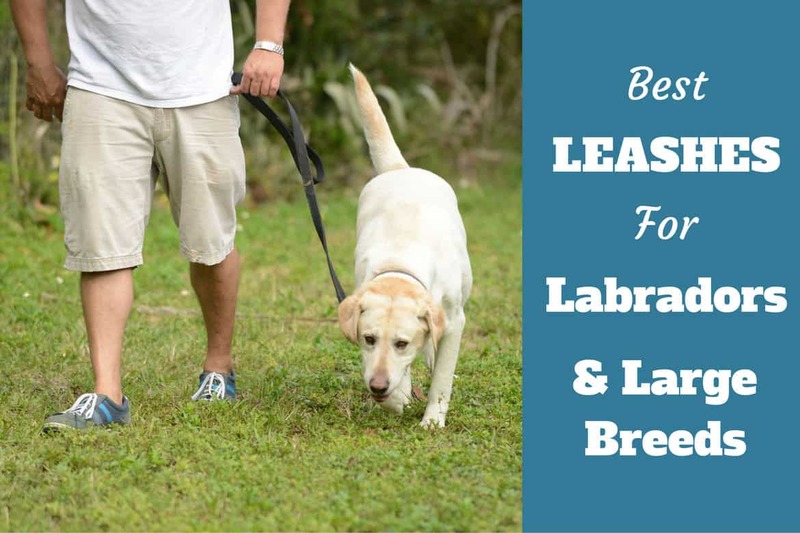 Read on to discover some of the best leashes for labradors and large breeds available on the market today. This is just a small selection of the leashes reviewed in our roundup. For more, please continue to our article below. 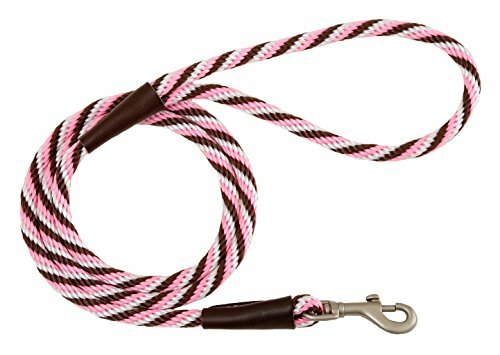 Coastal Pet Products Nylon Remington Rope Slip Dog Leash, 6-Foot. Available in 1/2″ and 3/4″ widths, and 4 foot and 6 foot lengths. Also available in black, blue pink or yellow. This leash is hand made by ‘Sassy DogWear’ in the USA, constructed from durable nylon webbing that is truly built to last, yet nice and light for use with young puppies. The ‘bolt snap clip’ makes clipping the leash on and off your puppy’s collar a breeze, yet doesn’t allow them any opportunity to break free from your control. 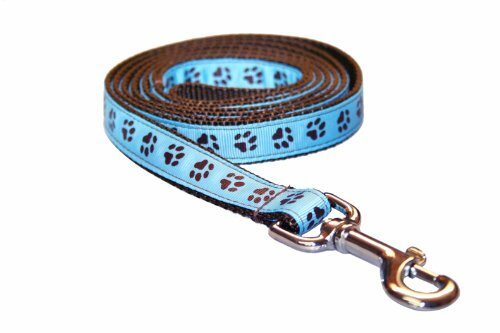 Although we’d personally prefer a more ‘mature looking’ leash for an adult Labrador, this paw print design gives added cuteness to a puppy’s already adorable look and we’re sure will complement and keep safe any puppy. Made from 4mm thick, 100% full grain genuine leather with a stylish braided section at the connecting end, this lead is incredibly good looking while being incredibly durable and will in most cases be a leash for life it will last so long. Being quite firm and stiff at first, it will soften and become more pliable after a short time of use, so don’t let the initial feeling put you off. It’s a sign of quality you will find with any leather leash. At the connecting end, we find a snap hook attachment that is rust and corrosion resistant that will match the long lifetime of the leash. This is a very strong and stylish leash, perfect for everyday use whether on a daily walk or training session. And not everyone will agree, but we think leather leashes are the perfect match and most suitable style-wise for the noble looking Labrador. 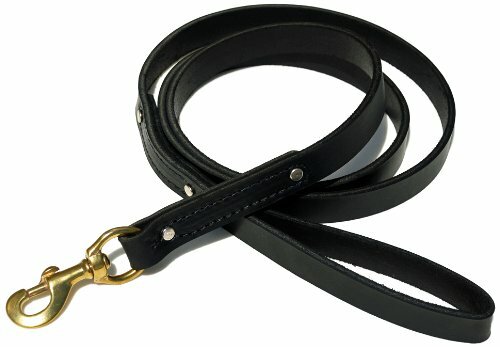 A very high strength, 1/4″ thick and 7/8″ wide, heavy-duty, durable leather leash available in black or burgundy. Marketed as a ‘Law Enforcement and Military grade professional training equipment‘ standard leas, it’s certainly built to last, as documented and greed with by the many positive reviewers . The Leather is stitched with extra strong thread, is double riveted both ends and is fitted with a larger than most 1 inch bolt snap for easy attachment and removal from a collar. This leash truly will last a lifetime! 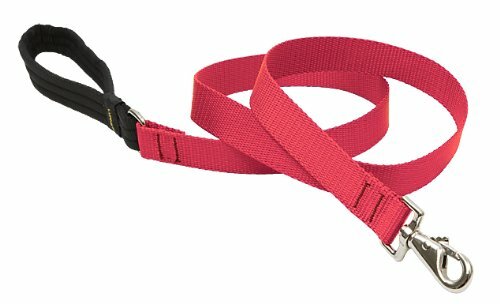 This 6-Foot, 3/4 inch fanbelt leash is incredibly strong and well suited to large, strong dogs such as labradors, boxers, dobermans and more. It’s constructed from nylon webbing, with reflective thread stitched along the length of the leash to help visibility at night in front of approaching vehicles with headlights on. For attachment and removal to a collar there is a nickel plated bolt-style clip which is rust-proof and stain resistant, so will remain remain tarnish free for the life of the leash. The main benefit of such a leash over leather leashes is there is absolutely no care or upkeep necessary to keep it in tip-top condition. Leather leashes need the occasional application of conditioning oils to keep them pristine, but this leash you can simply rinse in soap and water and it’s back to good as new. Available in 10 different colors, with very good feedback from previous buyers, this is a perfect leash for every day use with medium to large dogs. A woven nylon leash available in, 2, 4 and 6 foot lengths; 1/2″, 3/4″ and 1″ thicknesses; and 6 colors of black, orange, blue, green, purple and red. So one thing’s for sure with this leash, there is one that’s right for everybody! This leash has a zinc plated reverse-gate snap attachment for attaching the leash to your pooches collar. It has strong bar-tack stitching which is very durable and long-lasting. In fact it comes with a manufacturer guarantee that it will last – even if chewed! – so you can rest assured you won’t have to replace it any time soon after purchase. 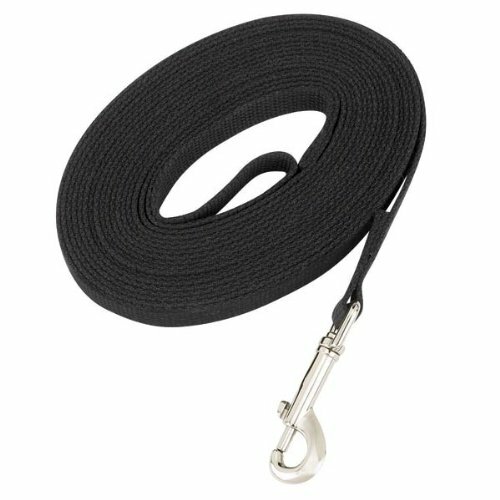 Finally, for comfort and ease of use, this leash has a padded handle which is a nice and very welcome addition that if you’ve used a standard nylon leash before I am sure you will agree with. Long walks, especially if your dog’s a puller and the handle gets wet, can make for sore hands if the nylon isn’t padded. We’re very happy to recommend this leash! 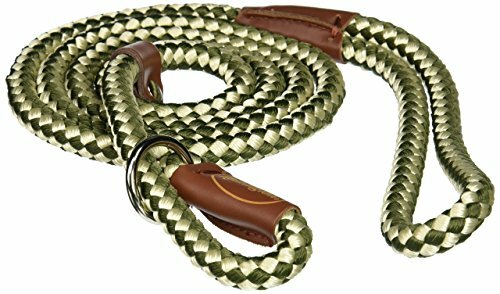 A durable, braided leash made from multi-filament polypropylene, brass hardware and tanned leather splices. Easy to use and soft on the hands, perfect for every day use. Available in two thicknesses of 3/8 and 1/2 inch, (I recommend the 1/2 inch for a strong dog like a Lab), 4 or 6 foot in length and many different color options, there is a style that sure to suit everyone. 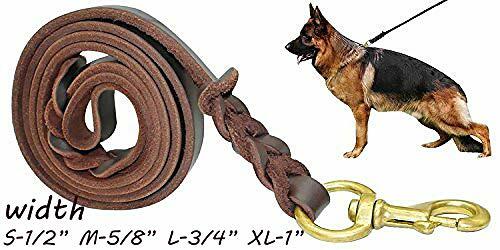 Nice and lightweight, yet certainly durable and strong, a nice sized hand loop made of non-abrasive rope, with a simple thumb operated snap-bolt clip all makes this leash a pleasure to use and safe for controlling your dog. Certainly recommended! This is an easy ‘on and off’ slip-lead made from durable multi-filament polypropylene, available in 10 different colors and 4 foot or 5 foot lengths, there should be one to suit all tastes. This style of lead is very easy to use, I personally keep one near my front door to easily slip on and off my dog because we have him collar free while in the home. One word of warning though: If your dog is a frequent – or non-stop – puller, then this isn’t the lead for you. The leash gets tighter if pulled from either end so if your dog pulls, it will tighten around their neck and be very uncomfortable. You won’t find a more convenient style of leash for ease of getting it on and off your pooch, I couldn’t live without one. Made of soft braided nylon material, pliable, not harsh on the hands while maintaining incredible strength and durability. This slip-lead is an all-in-one collar and leash, made from a single piece of rope or cord that’s extremely easy to put on and take off by simply slipping over your dog’s head as desired. 6 foot in length and available in a green and white check color with brown leather trim. 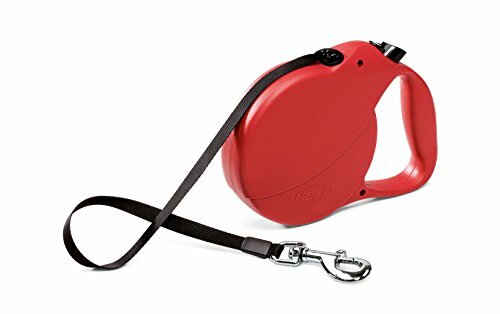 Well suited to working dogs who need to be released very quickly, but as previously stated, I like to keep one by my door in case I need to control my dog quickly which can otherwise be difficult because he doesn’t wear a collar while at home. A retractable leash affords your dog more freedom to walk away from you and explore, while you still have some control being at the end of an extended leash, but also in control of exactly how much leash they get to play with. I’m not a great fan of these leashes because they can encourage pulling. However, if yours is a dog who frequently runs away, or you feel you simply cannot allow to run off leash, this is a nice compromise. They get more freedom than with a 6-foot leash, but still cannot bolt free. This particular ribbon style retractable leash gives up to 13.5-foot length, and is made from material that doesn’t burn your skin if your dog mistakenly wraps it around your legs. This happens more than you might think! 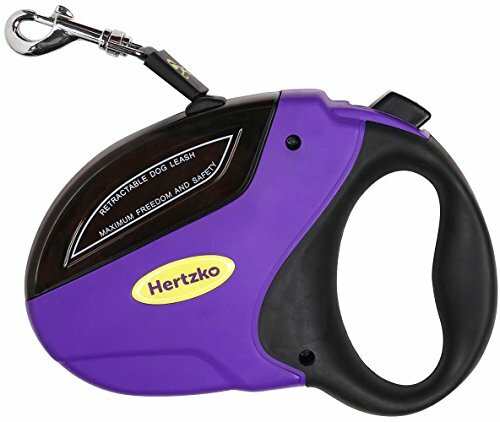 The manufacturer, Hertzko, are so sure of its quality it comes with with a 100% money back, 2-year guarantee. A retractable dog leash suitable for strong dogs up to 100 pounds. This leash allows you to control and vary it’s length up to 26 feet, for use when walking your dog in open spaces so they can enjoy more freedom while still on leash and under your control. Single hand-operated hand braking, locking mechanism and recoil system gives you full, easy and intuitive control. Available in Blue, Black and Red. It comes with an instruction leaflet detailing how to use it correctly with safety in mind for you, your dog and everybody else around. These cotton webbing training leashes come with a swivel-style snap-bolt attachment, and are available in 15, 20, 30 and 50 foot lengths to keep your dog under your control when training outside at medium to long distances. These leashes are essential when beginning distance training sessions, while your dog isn’t yet skilled enough to remain concentrated on you and the job at hand. The last thing you want when training distance commands is your dog to wander off and start sniffing up trees or chasing squirrels and a long leash such as this makes sure you can keep their attention on you and the training session. Backed up with a life time guarantee and a huge number of positive feedback reviews on Amazon, these long leashes come highly recommended. Please be aware this page contains affiliate links and Labrador Training HQ receives a small commission if you purchase an item through such a link. This has no effect whatsoever on the eventual price you pay and we’re very grateful for your support.